Your Nexus 7 provides you with the opportunity to chat with friends by starting a Google+ hangout. Video chat with Google Talk involves you and one other person. Video chat with Google+ can involve a legion of your friends. Your friends have to use Google+ and be available online with a gizmo that sports a front-facing camera. All they have to do after that is start or join a hangout. Choose Hangout from the App button menu. If you don’t see the Hangout item, keep touching the App button (found in the upper-left corner of the screen) until you do. The Start a Hangout screen appears. Its purpose is to offer you a chance to invite, or alert, online friends about your hangout and potentially have them join you. Invite people to your hangout. The text box is your invite list, like the To field in an e-mail message. You can type a name, use the Plus (+) button, or pluck a picture on the screen to add them to the invite list. The process is similar to creating a list of contacts for sending an e-mail message. If you touch the Plus button, the Add People screen appears, where you can fetch contacts from your Google+ circles. Place check marks by your circles or by individuals you want to invite, and then touch the OK button. The People You May Know list suggests some friends you can quickly invite by touching their contact icons. When you touch an icon, a green check mark appears, and that person’s name is added to the invite list. Start the hangout by touching the Start button. The Start button doesn’t work until you’ve invited at least one other person to the hangout. Your invitations fly out to the people you invited. The tablet may ring, like you’re listening to an outgoing phone call. Eventually, someone will join and you can video-chat. Others you’ve invited may join after that. If no one joins, you see a disappointing reminder on the screen that you have no friends who want to hang out — or something like that. Do whatever you would normally do with your friends — talk, make faces, dish about your enemies. It’s like being there in person, but you’re using the Nexus 7. 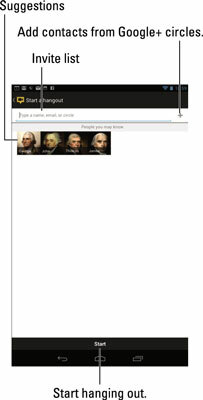 You can add people to the hangout by using the Add button that appears in the upper-right corner of the screen. The Add button appears only when you are the hangout host. When you’re done, end the hangout by touching the red Close (X) button. Because you’re the host of the hangout, when you leave, everyone else is tossed out as well. As a Google+ citizen, you may someday receive an invite from someone you know (or maybe someone you don’t know) to join a hangout. When you do, you see either a notification appears atop the screen or, if you’re using the Google+ app at the time, an Incoming Hangout screen. To join the hangout, swipe the Camera icon button (shown in the margin) to the right. Your tablet’s camera turns on, and you can see the other person (or people) in the hangout. To leave the hangout, touch the red X. You can mute the speaker or disable video by touching the microphone and camera icons at the bottom of the screen during a hangout.